I’ve just had a few days away in the Lake District, walking the fells with a friend. We had a great time, if somewhat tiring! Of course I had to take a little stitching to keep me amused in the evenings! I decided to take another double page spread of my stitch dictionary. I started this project a couple of months ago as a small portable bit of stitching. It’s not quite as portable as I envisaged as inevitably I need to be near a mobile or my computer for a lot of it to get the instructions off Pintangle. Sharon on Pintangle has created an amazing resource with her stitch dictionary, hundreds of different stitches with easy to follow instructions and lots of examples! I’m trying to stitch all 100 TAST stitches in a fabric book, I’ve put them all into stitch groups so this time I started with a page on cretan stitch, number 4 of the TAST stitches. I used DMC 4515 for all these stitches. Cretan stitch is a bit like feather stitch, just a bit more regulated and square. I worked a basic cretan stitch first, then started to have a bit of a play with narrow bands, interlocking bands, close cretan stitch (very close together!). 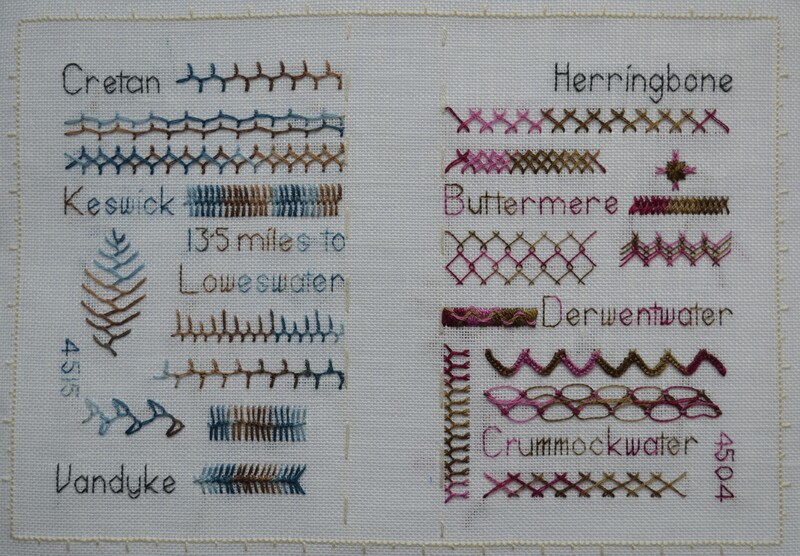 These were all embroidered during my first evening in a lovely B&B in Keswick. Our second night was in an old farmhouse above Loweswater, we had walked 13.5 miles from Whinlatter Forest which seen as we were expecting an 11 mile walk, seemed an awful long way, especially when it rained! After tea round the farmhouse table I had time to do a few more rows. Cretan stitch can also be used to make a leaf, the height of the uprights can also be varied. Knotted cretan stitch (TAST no. 21) has a simple knot formed at each junction, I did that one from memory as there was no internet (or phone signal) in the farmhouse. I was pleased to see I’d remembered it right when I returned to the land of technology! I think it would be more effective in a thicker thread such as a perle, but I only had stranded cotton with me. The list of stitches I’d taken with me included looped cretan, my stitch book didn’t have that but had a ‘looped’ stitch, it looked like it could be from the same family, it’s a bit like the close cretan, so I stitched a short length . I found the next day that looped cretan (TAST 50) is completely different, like triangles of cretan stitch, luckily I had enough room left to add a short length of that too. At the bottom I had enough room to add another stitch, Van dyke (TAST 28), it’s a similar style to cretan, just formed slightly differently. The next day we followed a very pretty path through woodland along the far side of Loweswater, followed by a very boggy path along Crummockwater to reach our next B&B at Buttermere. We had internet there but no mobile!! I started a new page of Herringbone using DMC 4504. The herringbone stitch below the square is another length of closed herringbone, just much closer together, this creates a double row of back stitch on the reverse and so can be used for shadow work. Having found the internet again and the ideas on Pintangle I played a bit with rows of herringbone in a sort of net design and then stacked closely together. This one was a bit fiddly as the little crosses form over the longstitch above. On our third day we were meant to walk back to Keswick, we had a better plan, we walked down to the shores of Buttermere before catching a bus which takes a very scenic route, then had a lovely walk along the shores of Derwentwater before catching the launch back to Keswick. During the last evening I stitched a raised herringbone band (TAST 75) which is another one done in layers. The bottom layer is a band of satin stitch. The herringbone is stitched over this. A whipping stitch is then used through the herringbone, it does create a lovely effect. I think the next one is my favourite, buttonholed herringbone (TAST 51) A row of herringbone is stitched first as a base, each length is then covered in buttonhole stitch with one stitch at the junctions. I think it looks a bit like foliage swags! Fancy herringbone was next to learn (TAST 70) I’m not sure about this one, it’s probably another stitch that would be much better in a different thread. A base of herringbone is stitched, followed by tiny crosses over each junction. The top thread is then woven through the tiny stitches to create a loopy effect. I think it would look neater with a more springy thread that held a curve. The bottom stitch is double herringbone 1, which is two rows of herringbone interlinked. The pretty stitch up the side is breton stitch (TAST 85) which is like a herringbone with a twist! So in these two pages I think I’ve included eleven different TAST stitches, plus a couple of extras. 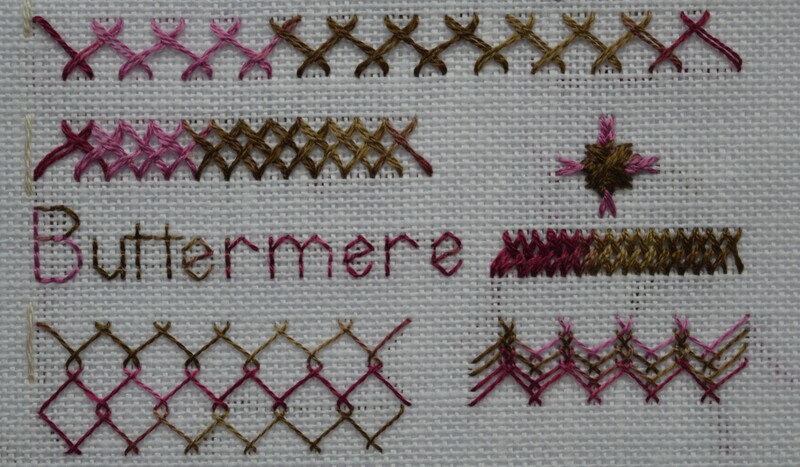 I’ve also stitched memories of our walk in the lakes. We’ve renamed it the Four Lakes Walk, hopefully I’ll tell you a bit more about it in the next couple of days. I’m linking up with Kathy’s Quilts for Slow Stitching Sunday, why not follow the link and have a look what everyone else is stitching today. This entry was posted in Serendipity, TAST, Textile Books and tagged Herringbone Stitch, TAST Cretan Stitch Van Dyke Stitch. Bookmark the permalink. Your embroidery book is coming on nicely! The attention to each page and arrangement of every detail, along with the stitches & colours is lovely! The photo of Buttermere also shows Haystacks, Wainright’s favourite fell and where he chose for his ashes to be scattered 🙂 I’ve got the full set of Wainright books and the path descriptions work just as well now as when they were written. Beautiful books! I don’t have any Wainwright books, but brief looks were made during the documentaries. How wonderful that you’ve got the full set. No wonder you’re a walker ~ such inspiration both in the countryside, and your fellow countrywomen (and men)! It’s like a cross between a stitch compendium and a travel guide! Thanks Kate, though I’m not sure how much travel there will be between now and march when we’ve got a big holiday! For those of us outside not only the Dales, but Yorkshire and indeed the whole UK, even short walks make a lovely travelogue! Lovely! I`m going to read through your blog and see your other designs. Thanks for sharing. I wish I could stitch like you, I have stitching talent envy! Thank you! I always think evenweave linen is the easiest fabric to do neat stitching on as the holes are already there, Sharons instructions are great, she makes it all very straightforward. Gosh you are absolutely flying along with your sampler! They look so well stitched as well. What a lovely way to spend a few days as well. We were there in summer, such a beautiful area! 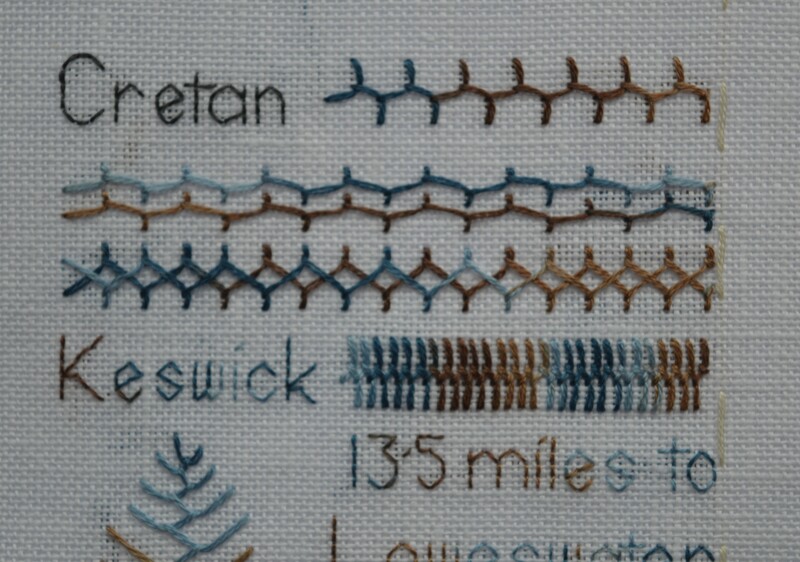 I love it up in the lakes, so it was nice to include it in the stitching. 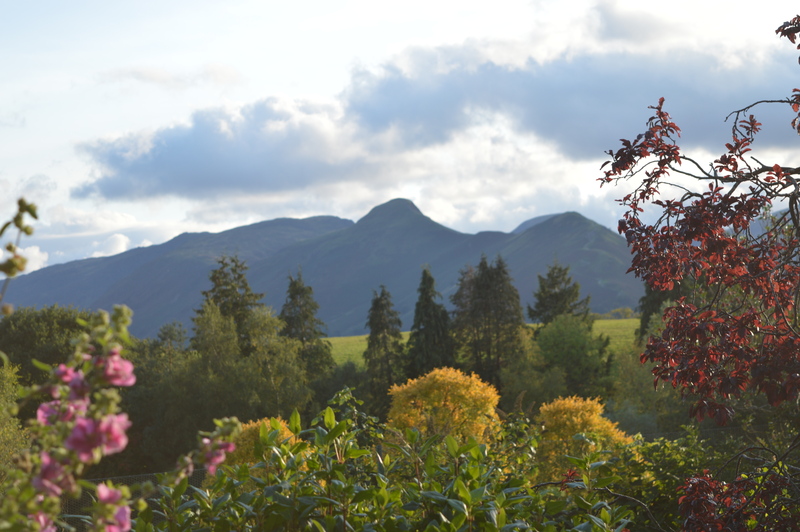 The Lake District is such a beautiful part of the uk. Love your stitch dictionary, it’s coming along beautifully. Your stitches are beautiful, love the embroidery threads you chose. 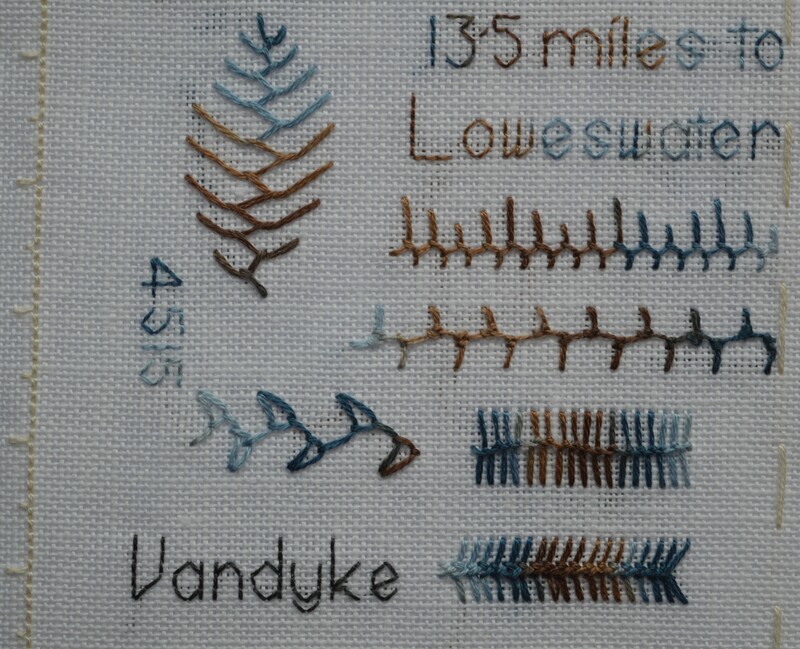 Now, if you start stitching while hiking, I’m going to get concerned!😉 I love your how your stitch book is developing, and the photos of the lake country are wonderful. So much to see in the UK! I’d be concerned too Kathy, as I would fall over a lot more than I do already!! The Lake District is beautiful, even in the rain! I´m just in the beginning of making a fabric book and I haven´t yet decided the theme for it. Maybe I´ll fill it with embroidery! Thanks for the inspiration! Thanks, if you are on facebook then Sharon from Pintangle has just started a new page called Fabric Books, lots of inspiration and tips there! Yes, I am already a member of her group! Love all the photos, they are so inspiring!!!! Beautiful scenes and beautiful stitch examples. Your colours go so well with them. 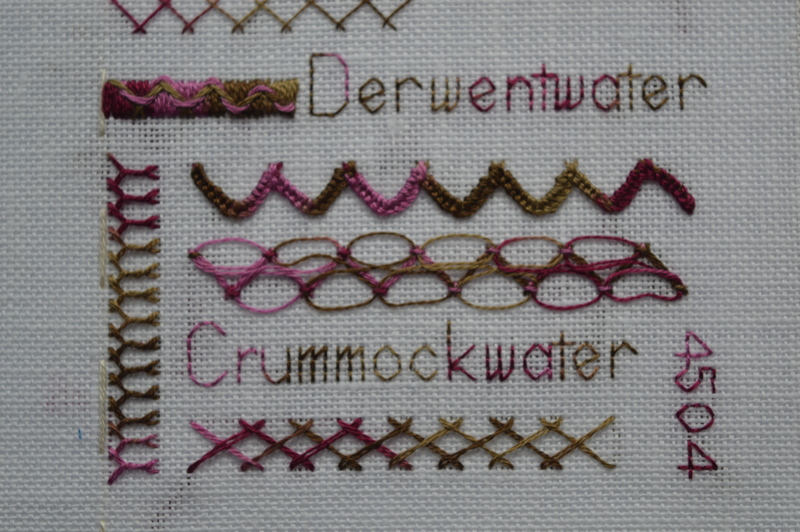 Hard to have a favourite but the Derwent/Crummockwater stitches seem like water moving, so it got extra viewing. This project is amazing! I love that buttonhole herringbone! And I’m glad to see you got at least a little sunshine on your walks. I just love your needle stitch book, your stitches are beautiful. I love all the walking you are doing, what a fantastic way to document your steps and stitching.